Even his own brothers and sisters abused him. "Oh," they would always say, "how we wish the cat would catch you, you ugly thing." And his mother said, "How I do wish you were miles away." 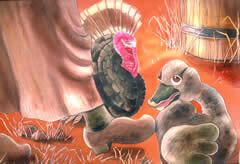 The ducks nipped him, and the hens pecked him, and the girl who fed them kicked him with her foot.